Steve O’Keefe has just been announced in the Cricket Australia Test Squad to take on Pakistan in the UAE. The first Test is in Dubai on October 22. The announcement comes as both massive excitement and relief for the 29 year old left-arm orthodox spinner as he has been pushing his claim for a Test birth for some time now – Steve has been statistically the best spin bowler in the Country since Shane Warne’s retirement collecting 128 wickets at 24.72. 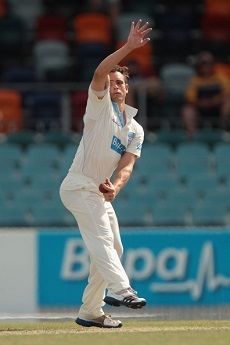 After topping the Sheffield Shield wicket-takers list last season claiming 41 wickets at 20.43, propelling NSW to the Shield title in the process and performing strongly for Australia A and NSW over the last month, Steve is as ready as he has ever has been to prove his worth on the International stage. “We are unsure what pitch conditions we will encounter in the UAE but we need to be prepared to play two spinners. Steve was the highest wicket-taker in the Bupa Sheffield Shield last season and we are confident he can perform at the next level.” Chairman of selectors Rod Marsh said. The inclusion of Steve highlights the hard work, persistence and determination he has shown throughout his career to never let go of the goal of earning a prestigeous Baggy Green. We wish him all the best!